Patient: Paris, spayed, 7 year old Pomeranian. Presenting Reason: Paris came to us in the spring of 2009 when she was 5 years old, for her annual vaccines and blood parasite screen (heartworm & tick screen). At this visit, a wellness blood check was also offered to her owner, who accepted running the blood work. A wellness test is additional blood work that checks a complete blood count (red and white blood cell numbers & platelet counts) as well as chemistries that check on organ function. Paris had not had any blood checked since she was spayed at 6 months of age. Physical Exam: Paris’s owner had not seen any abnormal changes in her behaviour, however she did want her teeth to be examined. A normal TPR (temperature, pulse, respiration rate) was seen upon exam. Paris had a history of seizures, but had not had one for over a month. Moderate tartar and mild gingivitis was noted on exam. A dental cleaning was recommended to improve Paris’s oral health. Lab Results: The wellness testing came back with a very high number of white blood cells (wbc) and low platelet numbers. The normal wbc should fall between 5.5 to 16.5 and Paris’s was 56.2! A differential (microscopic review of the blood smear) was performed and Paris was found to have very high numbers of lymphocytes*. A normal lymphocyte count should be 0.5-4. Paris’s count was 47.7! Due to the dramatic variation from normal her blood samples were sent out to lab for a pathologist to review. 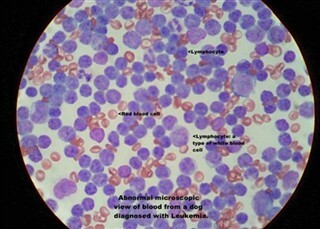 The pathologist found a marked lymphocytosis (high lymphocyte count) present. The number and the appearance of the lymphocytes were consistent with a diagnosis of lymphoid neoplasia (cancer in the blood. Further testing would be required to determine the type of cancer. Diagnostic Plan: Paris was referred to an oncologist (cancer specialist) to diagnosis the exact condition and discuss treatment options. The oncologist rechecked a complete blood count (cbc), which showed the wbc to be 90.8! After reviewing the blood work and Paris’s history she was diagnosed with chronic lymphocytic leukemia** (CLL). Treatment: Paris was started on Clorambucin an oral chemotherapy medication and Prednisone (a steroid). Regular recheck exams with the oncologist and blood screens are required to ensure no abnormal changes were being seen due to the medication. Case Outcome: By August (2 months later) Paris’s wbc had come down to 17.0, indicating that she was having a good response to the medication. By December Paris’s wbc (10.7) and lymphocyte count (4.07) was back to being within normal ranges. Two years later Paris is currently still on her medication, and is continuing to do very well. Although Paris’s story is extreme, we would never have found this disease without the routine blood analysis. Once a patient starts to show symptoms of illness, the disease is often too advanced and medications can no longer help. Thank you to Paris and her family for allowing us to share her story. *Lymphocytes are a type of white blood cell. There are 5 different types of white blood cells, each serving a different function. The lymphocyte’s main job is to help with the immune system. **Chronic Lymphocytic Leukemia (CLL) is a slowly progressive form of leukemia. This is typically a disease of older dogs with the average age of onset generally between 10 and 12 years. Dogs are usually asymptomatic and discovered on routine blood work. Complete remission is not expected. Blood chemistries not listed as all were within normal ranges. 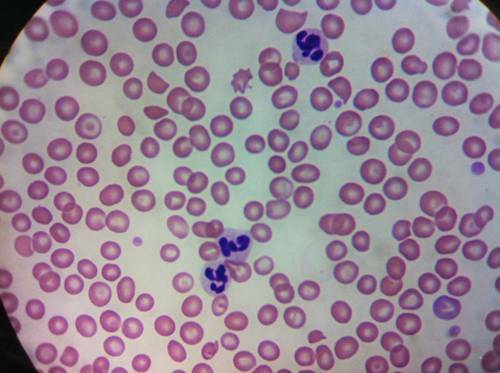 Figure 1 - A normal canine blood smear. June 18th, 2009 – CBC performed while at referral appointment (notice the huge change in number to the wbc and lymphocytes from previous check 2 weeks prior). This confirmed her diagnosis & treatment was initialised following this visit. NOTE: Reference ranges will vary slightly depending on the lab machines used. Thus, this is why our ranges are slightly different that the referral centre.